A team of researches based in the USA and Peru conducted a rigorous study on rabies in vampire bats, and found some intriguing results. First, a bit about rabies. This is a terrible disease which infects and kills mammals (including bats, cattle, and humans). Rabies virus is spread from mammal to mammal via saliva, usually from a bite. After crossing into a victim, the virus makes its way into the central nervous system. While the individual is incubating the virus, they do not show any symptom and cannot spread the virus to others. Contrary to popular belief, there is no evidence of healthy surviving vampire bats or other animals being carriers of rabies. Next, there is a battle between the victim’s immune system and the virus. If the animal wins, it develops an active titer and some degree of “immunity” (for instance, my titer is really high because I have rabies antibodies in my blood from several vaccinations). But if the virus wins, the animal develops rabies, which it can now spread to other individuals, and it begins to enter into a coma and die. There is no cure for rabies; once the disease develops, the victim is doomed to a painful death. Quite scary. How common is rabies in vampire bats? In North America rabies is relatively rare, but in Latin America, the link between rabies and vampire bats is a bigger problem. We don’t know exactly how common it is, but we can estimate. The authors analyzed 1086 blood samples from bats and found that 10% of them had rabies antibodies. This means that those bats are either (1) actively fighting the rabies virus, (2) have already developed rabies, or (3) have successfully fought the virus in the past and now have immunity. Within a colony, the presence of antibodies ranged from 3% to 29% of the bats. It would be very good to know how many of those vampire bats actually had the virus (versus had developed an immunity), but unfortunately, the presence of antibodies alone can’t distinguish between these cases. But the antibodies were found in all of the 20 colonies they sampled adequately, suggesting that rabies is pervasive in vampire bats, even if at low rates. “Vampiricide” — basically rat poison and petroleum jelly that is spread all over a poor vampire bat. Vampire bats with rabies can pass the deadly virus to any mammal they feed on, including cattle, horses, dogs, and even people. This has led people to equate vampire bat populations with rabies itself. Many people feel that to stop rabies, they have to end the existence of vampire bats. To give one example, the authors describe how farmers “lit fires in caves after two cows died of rabies in August 2010”. Unfortunately, these practices can also kill many species of fruit and nectar-feeding bats. 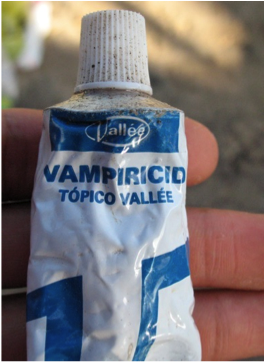 From my experience, the most popular or sought-after strategy among rabies agencies is to use “vampiricide”. This is a poison that is spread on the fur of captured vampire bats. The bat carries the poison back to the roost, and its spread to other bats through grooming and presumably food sharing. Then all the vampire bats in that grooming network die from the poison. That’s how managers typically “cull” vampire bats. But this is where the study comes in with some surprising results. The researchers found no effect of culling on the size of vampire bat colonies. Also, culling was correlated with increased rabies prevalence! In other words, there is no evidence that killing vampire bats decreased rabies prevalence; instead, it may even increase it. Take home message: Culling vampire bats to prevent rabies doesn’t work. Younger bats were more likely to have rabies antibodies in their blood. Out of all the factors they inspected, the presence of antibodies was most strongly correlated with the bat’s age category. It was higher in younger bats than in older bats, being most common in sub-adults. Based on experimental results from other bat species, the authors rule out the possibility that these antibodies were being passed down from mothers, suggesting that these young bats were actually more exposed to the virus for some reason. Apparently, this is not uncommon. A study of Canadian bats found that the young of the year comprised a whopping 39-84% of the few rabid bats found. Imagine a bat covered with vampiricide returning to the roost. First of all, the bats are always licking themselves, hence poisoning themselves. So both being groomed or grooming another should pose risks for poisoning. The adult females are the main social groomers; they are mainly licking their own juveniles, but also other juveniles and other adult females. So adult females are poisoning each other, and if the juveniles lick themselves, they will be poisoned too. The juvenile males are the next most common social groomers; they lick both adult females (poisoning themselves) and other juveniles equally. Close behind, or at the same basic level of social grooming, are the juvenile females that are doing the same thing as juvenile males. Finally, the adult males are hardly grooming anyone by comparison, just themselves. Then there’s food sharing, which would also pass the poison around. Again, most of that is directed to the younger bats, which rely on food donations from adult females on up to 1/3rd of their nights. Food sharing almost always involves mutual social grooming before and after. My point is that the juveniles are at the center of both social grooming and food sharing, and so they should be suffering from vampiricide poisoning the most, not the least. These videos of self-grooming and food sharing in vampire bats show how the poison would quickly get everywhere and in the mouths of many bats. This makes me think there might be some other explanation for the negative correlation between culling and antibody presence. The other big mystery is how often vampire bats develop immunity versus come down with rabies. As the authors put it, “although rabies is traditionally considered a lethal disease, the relatively high seroprevalence that we observed and the survival of seropositive individuals across years indicates that exposure does not always kill vampire bats, and may instead result in some degree of immunity…characterizing the probability of lethal infection versus naturally acquired immunity is critical to understanding long-term maintenance.” Indeed. Other studies indicate that vampire bats are very good at fighting off rabies virus, as one would expect from natural selection. This is a great study. I would love to talk with the authors! Killing vampire bats was never really a great way to control rabies. In North America, 97% of rabies cases involve dogs. By comparison, indiscriminately killing dogs or any other wildlife is clearly a pretty desperate response. A more effective alternative is to vaccinate cattle and other potential hosts. Researchers are already developing different ways of vaccinating vampire bats. 1 Response to Is killing vampire bats good for public health? No. It might increase rabies risks.